“The Nazis celebrated their coming to power by torchlight processions… I remember them coming past with their torches singing anti-Semitic songs, looking forward to Jewish blood splashing from their knives”. Heinz spent his early life in Fürth, a small town near Nuremberg where his family ran a textile business. Heinz led a normal life as a young boy and went to a traditional German grammar school. Heinz clearly remembers the Nazi rise to power, two weeks before his 13th birthday. Torchlit processions lined the streets. Heinz recalls the general view that this was a passing phase that wouldn’t last. By 1935 Heinz was one of only three Jewish boys to remain at the grammar school. He recalls an episode in which the Hitler Youth leader told them, “We don’t want Jews here”. However the boys stayed on with the support of their families and non-Nazi schoolmates. In the same year, Heinz’s older brother, Frank, left Germany after the Nazi staff representative where he worked reported his relationship with a non-Jewish girl to the local Gestapo. It was clear that Frank would be in danger so the family decided that he would ‘disappear’. He spent six months in Switzerland and from there managed to get a permit to come to England. At 16 Heinz left school and began a two-year apprenticeship at an advertising firm. By the time he finished, in 1938, he says “it had become obvious that we would have to leave Germany”. He went to Hamburg to do an intensive English language course while the family tried to find a way to get him out. Heinz was living in student digs in Hamburg on 9 November 1938, when the murder of a German diplomat in Paris became the excuse for the pogrom known as Kristallnacht. Heinz has vivid memories of Kristallnacht. He was woken by a phone call from his mother at 4am. She told him “Father’s gone away”, which was code for “he’s been arrested”, and told Heinz to “go for a walk” immediately. Heinz spent the next 16 hours walking the streets and saw the synagogues burning, smoke everywhere and groups of Jews being rounded up and marched through the streets. He escaped arrest, but his father was sent to Dachau concentration camp for 6 weeks, an experience that changed him for life. Kristallnacht made it very clear to the family that they would have to escape. It was a difficult time; with quotas and immigration restrictions there were few options available. Eventually Frank, by now living in Leeds, managed to get Heinz a trainee post in a clothing factory and he left Hamburg for London in February 1939. The very first thing he did on arrival at Leeds station, was take a tram to Elland Road to watch Leeds United draw 1-1 with Everton. The passion for Leeds United has stayed with him ever since. 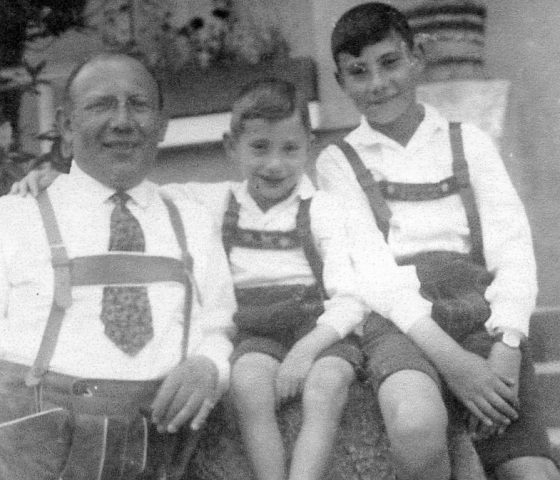 Heinz settled into his job in a garment factory and he and Frank concentrated all their efforts on getting their parents out of Nuremberg. They finally managed to get visas, and their parents arrived in England on August 27th, a mere four days before war broke out. The family was reunited in Leeds, but this wasn’t the end of their difficulties. On the outbreak of war, any Germans living in England immediately came under suspicion, no matter what their circumstances. The British Government began tribunals that categorised them as either Enemy Aliens or Friendly Aliens according to the threat they were thought to pose. In Leeds, all Jewish refugees were made Category B Enemy Aliens. In May 1940 Heinz and his family were arrested and interned. Heinz and Frank were sent first to an internment camp on the Isle of Man, and subsequently to Canada, where they remained until August 1942. Heinz understands the reasoning behind the policy but remembers a sense of resentment: having being forced out of Germany for being Jewish, he was now interned by the British authorities as a German, despite being more anti-Nazi than most British people. On his return from Canada Heinz volunteered for war work and spent the rest of the war working in engineering. He also met and married Thea, a fellow Jewish refugee who had arrived in England with the Kindertransport. After the war, they were keen to become naturalised and were granted British citizenship in 1947, a significant moment for them. It didn’t take them long to feel settled in Britain and make a contribution to the community. Heinz began work for the Jewish Welfare Board and in 1976 received his MBE in recognition of a lifetime of dedication to community work.